When Chris and I were first discussing the plan to downsize and travel, we decided to establish a loose target date to have the house ready to put on the market. Anticipating that our house might sell quickly, we also agreed that we need to be mostly ready regarding the move details. Meaning we need to decide where to live, research apartment options, prepare visa application, study travel insurance and domestic insurance options, figure out banking arrangements, and create a reasonable budget including income streams, etc., etc., etc. Those two dimensions include a lot of work to be done, some tasks to be worked separately and others jointly. And even with a draft list of tasks, we realize this is quite a daunting set for a preliminary June target. One thing we agreed is that the pace of work would not be such that we can’t enjoy our current lives being retired in Longwood Fl. Be Here Now is a philosophy we both endorse (what year did Ram Das write his inspirational book? ), though Chris appears to have an easier time with it. Guess working as a project manager for almost 40 years pushed me to spend more time looking ahead and planning next steps. Our daily walks provide both exercise and time to share thoughts. But I also like my daily reading time. A Kindle provides additional portable reading options and I also still do check out books at the library. I am currently reading “My Life in France”, a memoir by Julia Child. What a great book! The writing is excellent and moves me from laughter (“it’s easy to get the feeling that you know the language just because when you order a beer they don’t bring you oysters…”) to drooling when she describes a delicious dish she has prepared. 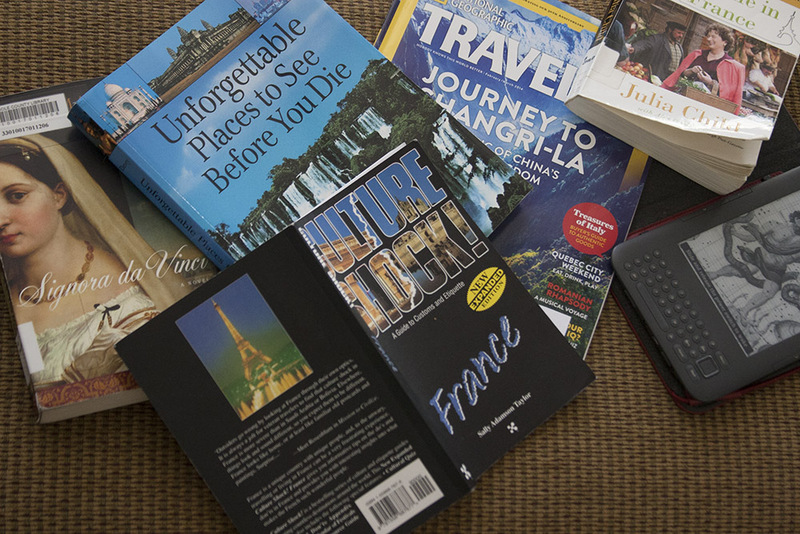 I am also reading various travel blogs to understand life in France. Since my clothing will be much more limited than I’m used to at home, I’ve been looking at blogs that discuss fashion. “Find a comfortable, nice outfit for traveling. Watching you guys come off a plane or train is like witnessing a 4AM fire drill at a college dorm.” If you’ve ever spent much time in airports, you know well how true and sad this statement is. The only way to look good coming off an international flight is to charter a plane so you can freshen up (shower?) and change before disembarking!